The much awaited 'Anegan' starring Dhanush release today world wide. A perfect Valentine’s day treat as the script revolves around love in different eras. "Anegan" is getting a fantastic response and big screens have now been given to Dhanush's movie. For a normal working day, the advance bookings are looking very encouraging indeed and Dhanush is set for back to back grand openings after VIP last year. 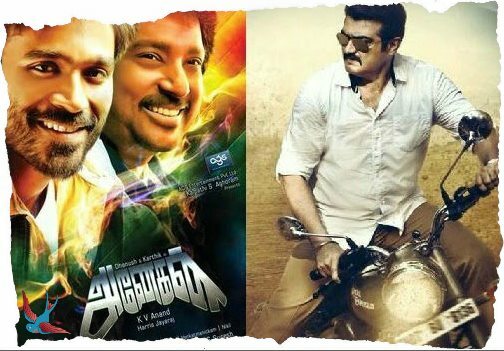 The Ajith starrer is making way for Anegan in almost all the big screens while in a few, both the films are sharing the big screen. Ajith’s Yennai Arindhaal has been replaced in over 70% of the screens by Dhanush’s Anegan. The movie will put a halt to the stupendous run of Ajith’s Yennai Arindhaal. Dhanush is yet to cement his name in the industry as an A-lister but is giving competition to a star like Ajith and snatching away some big screens from "Yennai Arindhaal".